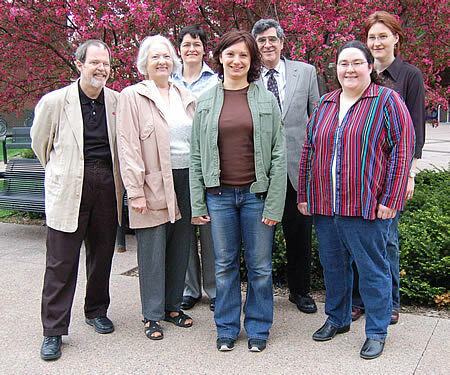 Minnesota’s longstanding tradition of friendship and cooperation with Austria, which has extended over many decades, is strongly reflected in the Center for Austrian Studies(CAS), established thirty years ago at the University of Minnesota. The Center is not only committed to academia but is engaged in public outreach and active involvement with the community. Part of the University of Minnesota is called the &quot;West Bank&quot; because it is on the west bank of the Mississippi River, which splits the Twin Cities campus; in the ditance is some of downtown Minneapolis. By promoting an awareness of Austrian culture and history, it serves as a focal point for studying Austria across disciplines -including the humanities, social sciences, applied sciences, and the fine arts - and it has a long record of bringing distinguished faculty from Austria’s universities to teach at the University of Minnesota, enriching both graduate and undergraduate education. The Center for Austrian Studies works closely together with the Vienna University of Economics and Business Administration (Wirtschaftsuniversität Wien), the Karl Franzens University of Graz, the University of Salzburg and individual institutes within the University of Vienna. The center is part of the College of Liberal Arts, and visiting Austrian faculty have come primarily in the humanities, social sciences, and arts. Since 2001, one visiting Austrian professor has come each year as part of the Fulbright Visiting Professorship program created in 1991 as a partnership among the Austrian Fulbright Commission, CAS, and the College of Liberal Arts at the University of Minnesota. Also, a number of distinguished researchers and teachers have come to the University of Minnesota to do post-doctoral research. In 1977 a delegation headed by Federal Chancellor Dr. Bruno Kreisky presented the University of Minnesota with a gift of one million dollars as an endowment for establishing a Center for Austrian Studies. The grant, which came from private as well as public sources, was presented on the occasion of America’s celebration of its 200th anniversary (1976). It was a generous gesture from Austria in appreciation for the significant financial aid given under the Marshall Plan to aid Austria’s recovery from World War II. There were a number of reasons for the decision to select the University of Minnesota, as the Center’s founding director, William E. Wright, recalls: the idea of using the grant for a long-term project supporting Austrian studies instead of specific, short-term activity; the University of Minnesota being at the time the largest single university in the nation with many different faculties, enabling a wider range of exchange between the two countries; its status as a prestigious, public university that made it a natural partner for the public universities of Austria; finally its location in the American heartland. Since Austria was already well represented by the institutes and cultural affairs officers of the Embassy and consulates on each coast, the Midwest and Central United States represented an area where the investment in cultural affairs was thought to be most effective. Since its founding the Center for Austrian Studies has sponsored activities including regular scholarly symposia, lectures, seminars, exhibitions, and community events involving Austrians. CAS was established with the grant, and it was never intended to use up the capital but only to work with the interest. The focal point was and continues to be what is now Austria, but it also encompasses other Central European countries which are connected with Austria due to their shared history as part of the Habsburg Monarchy. One important way of promoting studies of Austria was to bring the Austrian History Yearbook to the University of Minnesota and the CAS. Founded in 1965 by R. John Rath, the Austrian History Yearbook remains the leading English-language journal devoted to the history of the territories in Central Europe that were formerly under Habsburg rule and now comprise the modern states of Austria, the Czech Republic, Slovakia, Hungary, Slovenia, Croatia, Bosnia-Herzegovina and parts of Italy, Poland, Ukraine, Romania and Serbia. The activities of CAS have also included student exchanges, scholarships, internships, faculty cooperative programs and international scholarly symposia on Austrian and Central European affairs. In addition, the Kann Memorial Lectures were inaugurated (1984), featuring renowned speakers each year – scholars, or people from public or governmental positions - alternating between Austrians and North Americans. Prominent people in public and governmental positions, scholars, Austrian visiting professors and others have been invited. CAS has organized several exhibitions of Austrian art over the years and invited the Vienna Boys’ Choir (Wiener Sängerknaben) to perform. Visits by Austrian musicians and vocalists have been very popular with the Minnesota community. As Prof. Wright recalls, every year he offered a series of well attended public lectures on Austrian history and current events in the house of the Germanic-American Institute. “We engaged people and the community beyond the confines of academia.” That tradition continues today with an active program of public lectures and discussions sponsored each semester by CAS. Since soon after its founding, CAS has brought together nearly every year leading scholars from Europe and America for major scholarly symposia. Several of the conferences have been co-sponsored with other universities including the University of Alberta, Columbia University, Harvard University, and Indiana University and have taken place on their campuses. The topics of these symposia have ranged widely, including the Turkish siege of Vienna, the first and second Austrian republics, Austria in the NS years, Austrian women, the end of the Cold War and the impact on small European democracies, and baroque cities as embodiments of power. CAS has brought out volumes containing the best papers from many of these meetings in a book series published in recent years by Berghahn Books, entitled “Austrian and Habsburg Studies” (for more information, see http://www.cas.umn.edu/publications/books.html). In the thirty years of its existence, CAS has been able to contribute significantly to continuing a strong relationship with Austria. As an academic and cultural center, it has enabled many American students and researchers to meet with Austrians. This emphasis on research and education has opened up many opportunities due to the changes in Europe since the fall of the Iron Curtain and the importance of Austria as a business location and gateway to Central Eastern Europe. Over the last decade, an excellent exchange program has developed between the University of Minnesota’s Carlson School of Management and the Vienna University of Business and Economics (Wiener Wirtschafts-universität), bringing Austrian students to the U.S. every year while sending American students to Austria. One of the most successful programs is a joint executive MBA program offered primarily in Vienna. Currently 41 students are taking part, explains the Associate Dean for International Programs, Michael Houston, and it prepares senior executives and managers for today’s rapidly changing global marketplace. In May of each year the graduating students come to the University of Minnesota for the final portion of the program and to participate in Carlson School graduation ceremonies. The two other international programs concentrate on economic opportunities and the transitioning economies of Central and Eastern Europe. The Vienna Seminar and the Vienna Summer Program, both several weeks in duration, attract some 30-35 American students and offer the opportunity of studying with an array of international students at a top-ranking business university in the heart of Central Europe. (For more information, see: http://www.csom.umn.edu). When looking for information on Austrian history, researchers and others have discovered an interesting source, that of the Robert A. Kann Collection of Austrian History and Culture. In 1982, the University of Minnesota was honored to be chosen as the repository for Robert A. Kann’s personal library consisting of roughly 6,000 monographs, significant periodicals and some 800 off prints. The library is now an integral part of the Special Collections and Rare Books Division at the University of Minnesota’s Elmer L. Andersen Library and Archives Center and serves as a valuable resource for scholars in Austrian history at CAS and other U.S. academic centers. The Kann collection is the product of a single collector, Robert A. Kann, who was born in Vienna and fled Austria to the United States during the NS era. He devoted himself to studying and teaching Austrian history and his scholarly research focused on the interaction of the forces of conflict and integration in history. He became the leading authority on the evolution of ethnic tensions within the Habsburg Empire, and many items within the collection reflect this interest. Researchers and the Minnesota community also enjoy another rare collection which reflects decades of cooperation with Austria - the Hill Museum and Manuscript Library (HMML) in Collegeville, Minnesota. In early 1965, the Museum’s staff began microfilming medieval manuscripts at the Austrian monastery of Kremsmünster. After unsuccessful attempts in Italy and Switzerland, Father Oliver Kapsner, O.S.B., looked to Austria to find a starting place for his fledgling microfilming project. During the following eight years, Father Oliver and his successor, Father Urban Steiner, O.S.B., supervised the microfilming of more than 30,000 manuscripts and archival materials. The largest collection of approximately 14,000 manuscripts and several thousand papyrus fragments were filmed at the Austrian National Library (Österreichische Nationalbibliothek) in Vienna. The HMML collection now includes manuscripts from nearly all the libraries in Austria. It is the most complete of the Hill Museum’s collections, and many of the over 30,000 manuscripts and other documents are in languages other than Latin and German. All resources within this library are available to students, researchers and visitors. Subsequently, manuscripts were microfilmed in Germany, Portugal, Spain, England, Switzerland, Ethiopia and Malta. Digital preservation is currently being carried out in Lebanon, Syria and Turkey and more recently in Eastern Europe. As the Curator of the Austrian collection, Dr. Matthew Heintzelman, explains, it was the openness of the Austrians that made it possible to initiate this project. Today the Hill Museum & Manuscript Library houses the largest collection of manuscript images in the world with more than 30 million pages. Located on the campus of Saint John’s Abbey and University in Collegeville, it contains a collection of religious sculptures, paintings, prints, and artifacts, and preserves manuscripts, printed books and art, to which researchers, PhD candidates and others have access. Father Oliver L. Kapsner in front of the Austrian monestery of Kremsmuenster, where microfilming of medieval manuscripts began. The Museum is also home to The St. John’s Bible, the first handwritten, illuminated Bible commissioned in the West since the invention of the printing press in 1440. The St. John’s Bible is handwritten and is still being made. This Bible is of great interest to a larger audience. The Museum’s main mission remains, however, preserving unique manuscripts for future generations. Work is currently focused on places where the manuscripts might have problems of survival, such as countries that have economic problems, a potential for war or where physical conditions may lead to further deterioration of the manuscripts.